Industry 4.0 has an impact on your company too. 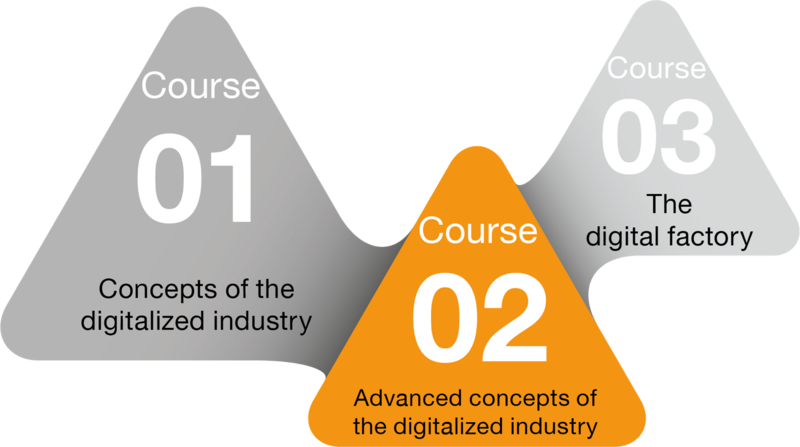 The digitalization and industry 4.0 driver licence is the only training concept based on a modular structure and a comprehensive framework. Driver licences are required to be able to operate in a controlled manner. Precisely this is the foundation of the training concept of the German innovation center for industry 4.0. Various conferences, congresses and workshops on industry 4.0 and digitalization are currently being offered. Many of these sessions are superficial, very general and have little implementation orientation. The digitalization and industry 4.0 driver licence is designed as a substantiated and practice-oriented training for the Mittelstand. With the aim of introducing participants systematically to the challenges of digitalization. Concrete solution concepts, technologies and case studies of industry 4.0 are demonstrated. Throughout the three courses, all significant facets of digitalization in industry are highlighted. Additionally, an evolutionary process for implementation is considered and discussed with the participants. With the digitalization and industry 4.0 driver licence especially the Mittelstand is prepared for the future. Specific operational questions and pragmatic solutions are the focal point. The digitalization and industry 4.0 driver licence offers a systematic approach to the digitalization of industry. In doing so we place high value on a high practice and application orientation. The training concept of the driver licence is especially aligned to the requirements of the Mittelstand and considers not only technological but also strategic questions from a cross-functional and cross-industry perspective. You learn specific solution approaches to industry 4.0 for your company. Additionally, you will develop a systematic understanding of the digital transformation of the industry. Based on already implemented industry 4.0 solutions you will gain an overview of the current state of digitalization. Further, you will have the opportunity to engage in an exchange with employees from other companies and industries. With a diverse combination of different training formats such as moderated communication of content, interactive group discussions and the analysis of case studies (implemented projects), the courses of the digitalization and industry 4.0 driver licence are designed in an entertaining way and are optimized to maximize training success. The training sessions are complemented by group exercises (e.g. technology feasibility estimation) and individual exercises (e.g. optimization potentials in your company).